If you find termite nests around your property or home it is important that you do not disturb or destroy the nest. Some termite species if left uncontrolled will cause significant damage to home and building structures in a very short time. Contact Wilson’s Pest Control for advice on termite Treatment methods available to protect your home or for an inspection of the property. There are many treatment options on the market and we can assist you in choosing the best solution for your property. Wilson’s Pest Control offer two products which are safe and family, pet friendly. Wilson’s Pest Control uses the most technically advanced termite solution, today which is why we as a pest controller we highly recommend it. Wilson’s Pest Control treatment is deadly to termites but not deadly to humans and the environment. Its termite fighting powers are based on advanced chemistry that targets termite muscles. The chemical works when a termite comes into contact with the treatment, causing their jaw muscles to lock. Within hours they’re no longer are able to feed. Wilson’s Pest Control treatment not only stop termites from eating your home the treatment ensures ongoing protection as well. After the treatment the termites stay alive long enough to transfer the chemical back to the nest and the colony. The colony is contaminated and eventually the queen and all the termite colony die as they cannot function. Wilson’s Pest Control treatment is applied to the soil around your property, the barrier created around the property safeguards your home for many years and a supplier offers long term warranty up to 7 years. Wilson’s Pest Control treatment when applied to the infested soil area stops the termite feeding within hours of exposure, this is because the termites’ mouthparts become paralyzed shortly after contacting treated soil which stops them eating soon after. Wilson’s Pest Control treatment being a delayed toxicant the termites that have stopped feeding can still move around, groom/aggregate in groups for a period of time, by this behavior the termite increases the chances of mutual grooming the body to body contact and behavior enhance the treatment to spread among colony of termites. Wilson’s Pest Control treatment provides a control that lasts, in summary laboratory test observed that when non-exposed termites workers were put together with exposed termites 100% mortality resulted of both exposed and unexposed groups were observed within 7 days. The key benefits are, controls termites in less than three months and provides long-lasting residual structural protection. 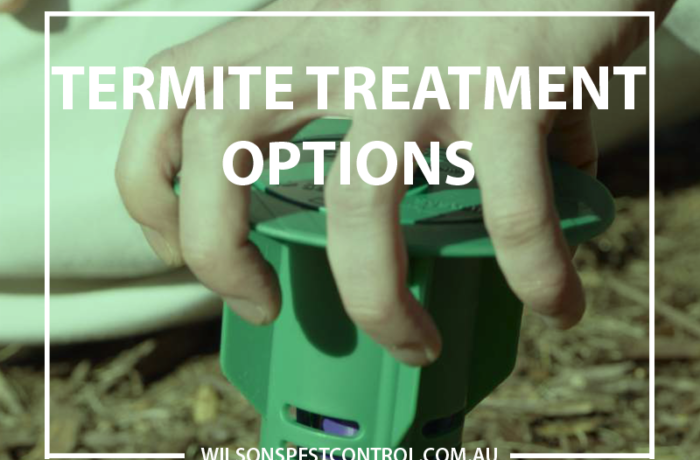 No other liquid termiticide product in Australia is as safe and unlike most termite products,our treatment safeguards people and property alike. Wilson’s Pest Control treatment is the only liquid termite treatment that is exempt from poison scheduling. It is safe for us and the owner as we do not have to wear protective gear (PPE) when applying the product. Wilson’s Pest Control treatment has very low toxicity and has an excellent environmental profile its safe around pets, birds, fish, earthworms and even honey bees. Baiting is another option available we like to use. Call Wilson’s Pest Control today on 0451 590 398 if you are worried about Termites in your home or business.